The trip was one of the highlight in our trip. Tour guide ah bao was very nice and explain many historical background of the sites as well as local culture. Of cos, he helped us to take many great group photos. The tour sites are so unique and different from normal tour. Highly recommend. Get US$9.3 back in Klook credits for your next trip when you book this activity! Complete this Klook activity to get 5% of the activity cost back in free credits to use on your next booking. For example, book US$185.55 to get US$9.3 free credits. 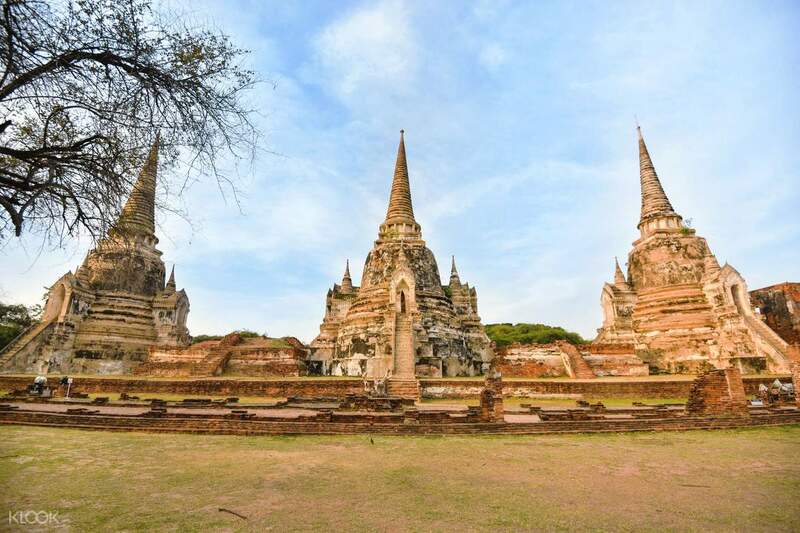 Travel 80 kilometers north of Bangkok to visit the historic city of Ayutthaya. 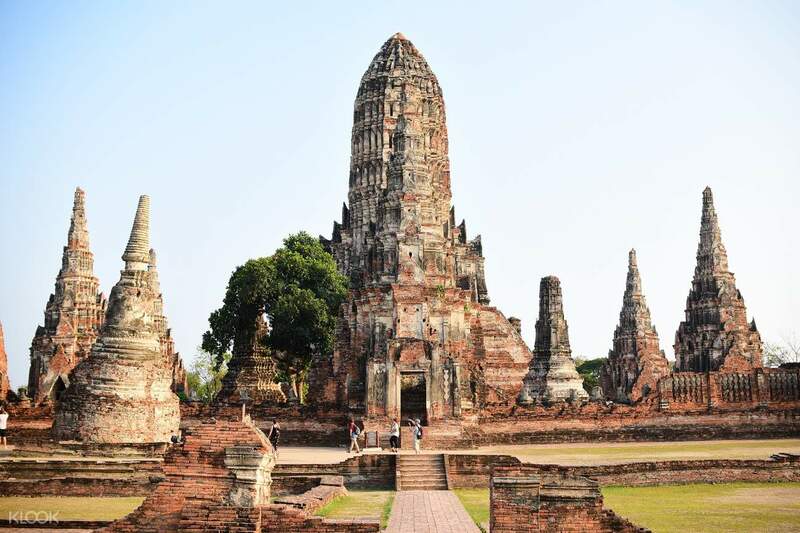 Ayutthaya is once the capital of the Kingdom of Siam-and now it's a UNESCO World Heritage Site and one of the most famous attractions in Thailand. In this tour, you'll visit Wat Yai Chaimongkhon or the Great Monastery of Auspicious Victory. 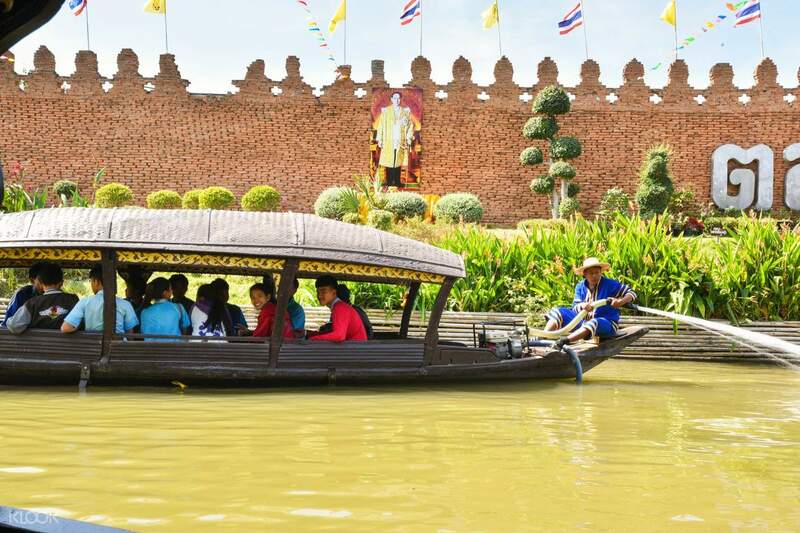 Then you'll head over to Ayutthaya Floating Market, wher you'll enjoy a delicious lunch or marvel at the walkways around the water and the boats plying their trade straight from the deck. The next stop is the restored temple of Wat Phra Si Sanphet, which is considered the grandest temple in Ayutthaya. You'll also visit Wat Mahathat and Wat Chaiwattanaram, before you return to Bangkok and relish in Bangkok street food at a local restaurant! You can also visit Wat Lokayasutharam, Wat Ratchaburana, and Wat Mahathat in this tour. Maximum 2 participants and 1 piece of luggage sized 24"
Maximum 5 participants without luggage or 4 participants and 2 pieces of luggage sized 24"
Maximum 10 participants and 8 pieces of luggage sized 24"
Received confirmation from AK Travel a day before tour with pick up time and guide's phone number. Install whatsapp to easily communicate with guide if you dont have a local Thai number. Driver was waiting for us early at hotel lobby. Guide was informative. Tour itinerary is well paced. Received confirmation from AK Travel a day before tour with pick up time and guide's phone number. Install whatsapp to easily communicate with guide if you dont have a local Thai number. Driver was waiting for us early at hotel lobby. Guide was informative. Tour itinerary is well paced. Wonderful trip, well arranged, very friendly and helpful guide and driver. My family of 9 had a very comfortable and memorable trip together exploring all the temples and floating market in Ayutthaya. Highly recommend this day trip (away from the busy city of Bangkok) to anyone traveling with their family! Wonderful trip, well arranged, very friendly and helpful guide and driver. My family of 9 had a very comfortable and memorable trip together exploring all the temples and floating market in Ayutthaya. Highly recommend this day trip (away from the busy city of Bangkok) to anyone traveling with their family! My guide are very fluent and kind lady who take care of our needs. She even offer to buy us the local desserts and cooling pack for the hot weather. 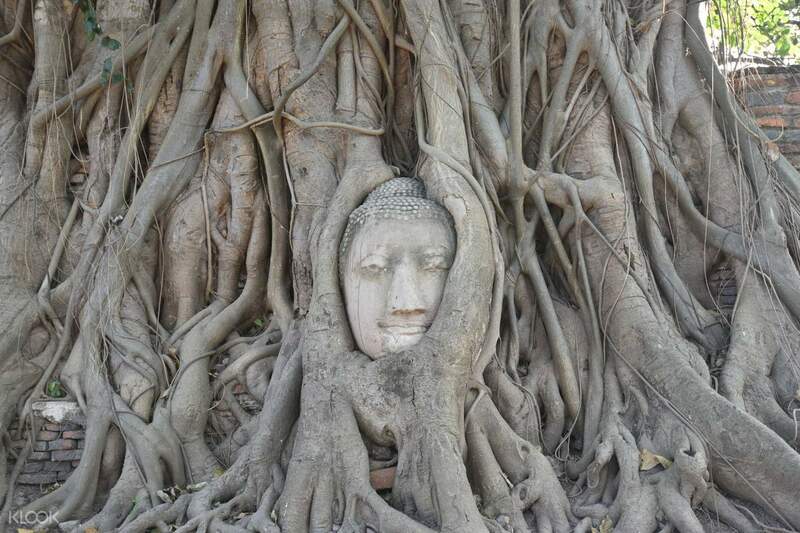 I will recommend this trip to anyone who are interested to know Ayutthaya history! My guide are very fluent and kind lady who take care of our needs. She even offer to buy us the local desserts and cooling pack for the hot weather. I will recommend this trip to anyone who are interested to know Ayutthaya history! we r really enjoy this trip. the travel agency n tour guide contacted me few days before the tour. they were flexible to change ur site spot. the tour guide tried their best to show us the thailand historial cultural. we r so apperciate for them. we r really enjoy this trip. the travel agency n tour guide contacted me few days before the tour. they were flexible to change ur site spot. the tour guide tried their best to show us the thailand historial cultural. we r so apperciate for them. Overall, the tour oackage was great. The tour guide share some fun story and tries to teach us how to speak in Thai. The temple in Ayutthaya was amazing and beautiful. The tour guide give us water and cold towel to beat the heat. Overall, the tour oackage was great. The tour guide share some fun story and tries to teach us how to speak in Thai. The temple in Ayutthaya was amazing and beautiful. The tour guide give us water and cold towel to beat the heat. Itinerary for the private tour is good and very organised. I joined the food tour, and the boat noodles is really yumm, I heard the dessert place for the afternoon tea is very famous as well. Nice tour. Itinerary for the private tour is good and very organised. I joined the food tour, and the boat noodles is really yumm, I heard the dessert place for the afternoon tea is very famous as well. Nice tour. We chose the classic tour. Our tour guide Mint (Ah 敏) was fluent in Mandarin as well as English! Definitely a great help for us as our family members are well versed in different languages. She was friendly and accommodating, frequently checked to see whether we were tired. She recommended us different food to try, bought us a small local snack and even bought us chilled handkerchiefs to overcome the weather! She was knowledgeable and explained to us the history of the Temples and places we went to. Note: if you want to have a chill and relaxing tour, I would recommend you to go for the food tour instead(: the classic tour had quite an amount of walking. We chose the classic tour. Our tour guide Mint (Ah 敏) was fluent in Mandarin as well as English! Definitely a great help for us as our family members are well versed in different languages. She was friendly and accommodating, frequently checked to see whether we were tired. She recommended us different food to try, bought us a small local snack and even bought us chilled handkerchiefs to overcome the weather! She was knowledgeable and explained to us the history of the Temples and places we went to. Note: if you want to have a chill and relaxing tour, I would recommend you to go for the food tour instead(: the classic tour had quite an amount of walking. Overall, good experiences for my family. The Guide was very professional, he contact me the day before on the time of arrival and the recommended attire. He explains clearly on the history of ayutthaya and also buys us on the popular snacks of ayutthaya. Overall, good experiences for my family. The Guide was very professional, he contact me the day before on the time of arrival and the recommended attire. He explains clearly on the history of ayutthaya and also buys us on the popular snacks of ayutthaya. We have a bubbly Aom bringing us around Ayutthaya. She is always eagerly explaining the rich history of each place we visit and the structure. Also taking every opportunity to snap photos for us at every nice angle. At the replica floating market, she brought us through 1 round, recommended food before leaving us alone for lunch & shopping. A nice gesture of Aom, to give us a roti Sai Mai treat. We visited 1 more Wat instead of per itinerary 4. Though the itinerary finished at dinner, as the tour is private, we requested her to send us back to hotel instead for early rest after a hot full day under strong sun We also have a smile on driver, safe & the car is super clean. We have a safe journey. We are happy with the itinerary planned, the level of service provided. We have a bubbly Aom bringing us around Ayutthaya. She is always eagerly explaining the rich history of each place we visit and the structure. Also taking every opportunity to snap photos for us at every nice angle. At the replica floating market, she brought us through 1 round, recommended food before leaving us alone for lunch & shopping. A nice gesture of Aom, to give us a roti Sai Mai treat. We visited 1 more Wat instead of per itinerary 4. Though the itinerary finished at dinner, as the tour is private, we requested her to send us back to hotel instead for early rest after a hot full day under strong sun We also have a smile on driver, safe & the car is super clean. We have a safe journey. We are happy with the itinerary planned, the level of service provided. My family enjoyed this tour. Hassle free since we got the private tour. We do our tour at our own phase. Our Tour Guide, Roger is very helpful and very accommodating. Thank you Klook. My family enjoyed this tour. Hassle free since we got the private tour. We do our tour at our own phase. Our Tour Guide, Roger is very helpful and very accommodating. Thank you Klook.